“Free Comic Book Day” at the El Morro Events Center brought Dale DeForest, creator, writer, and illustrator of Hero Twins to Gallup May 5. DeForest, who grew up in the Four Corners region of the Navajo Nation, gave the first 75 visitors a free copy of Hero Twins Issue 1 and spoke to comic book fans about his inspiration and why storylines from comics often mimic the good vs. evil themes of the Bible. “Hero Twins had very little to do with the actual Navajo creation story,” he said. Instead, he took elements from the tribal creation story to pen his own story about Navajo land circa 1860 in the midst of the cavalry roundup and the birth of twins with special qualities. The creation of Hero Twins, and DeForest’s artistic style, is rooted in the do-it-yourself ethic, a philosophy of independence that resonates with him in his work. 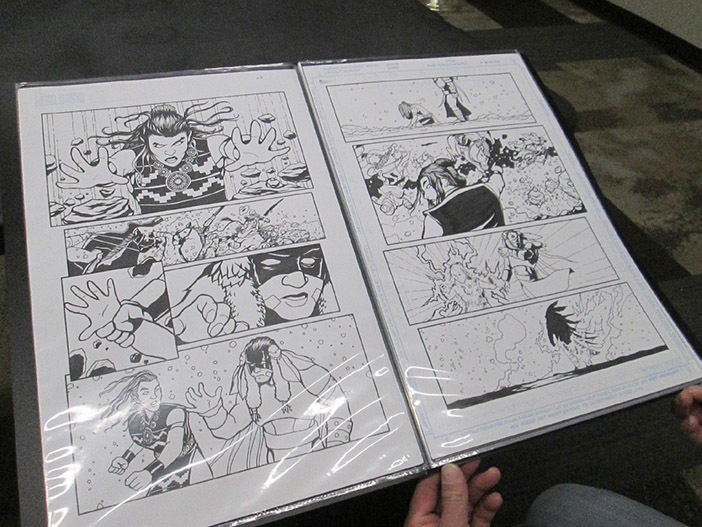 The comic’s foundation can be found in pen and ink drawings that began the process. “I draw on this tabloid-sized Bristol board. Just pen and ink drawing, black and white. 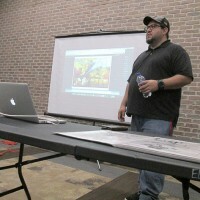 After that I scan it and import it into Photoshop,” he said of his process. Once imported, the artwork is sharpened through the use of levels in Photoshop. DeForest executes hard contrast applications to enhance the black and white imagery. “The artwork is on its own layer, but it has to be transparent, and once I do that, then I start coloring,” he explained to the crowd of fans. DeForest showed the audience this process step-by-step through use of a laptop and projector. The original master copy of the comic was also shared with the audience, so they could see the foundation of the comic book. DeForest said his inspiration came from his childhood love for comic books. Once he realized they were made from art and stories, it was a perfect fit. 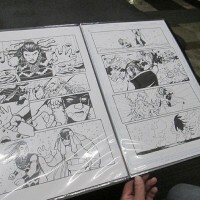 Issue 1 of Hero Twins took about a month create. DeForest worked on the comic from February to November 2017, working about an hour a night. Native Realities published the comic in September 2017. The clean, glossy publication features rich colors and distinctive Navajo imagery. The storyline follows the U.S. Calvary and their orders to burn and kill Navajos in an area now known as Ft. Defiance. DeForest wrote Issues 2 and 3 and began drawing for Issue 2 about two weeks ago. 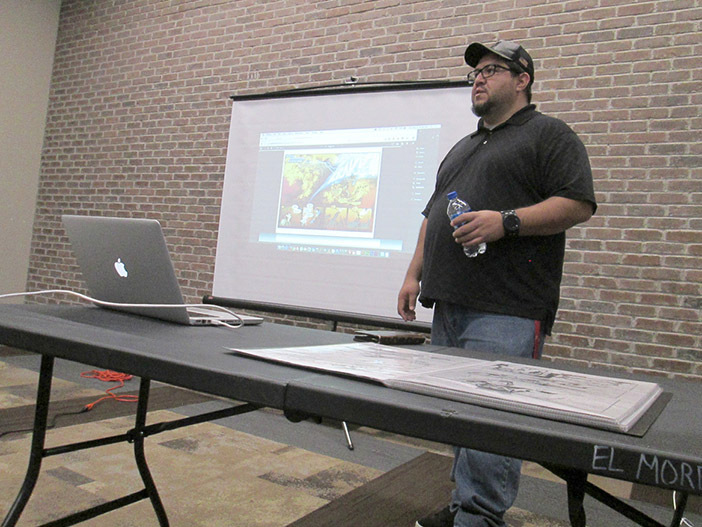 “I’m about five pages in and I hope to have it done by Indigenous Comic Con in November,” he said, referring to the three-day native pop culture convention in Albuquerque. Native representation in the comic world, and the chance for indigenous artists and fans to host their own comic con event, was a long time coming. You can find his larger-than-life graphic design work on the outskirts of Albuquerque on Interstate 40 and Interstate 25. Look for the Route 66 Casino billboards—which DeForest designed—and you will catch a glimpse of his unique, clean style. DeForest is a graduate of the Institute of American Indian Arts in Santa Fe, where he obtained a bachelor’s degree in photography on his journey to becoming one of the most prolific graphic artists of the region. For more information, visit www.daledeforest.com.